The Japanese Daiya Industry has released for rent a pneumatic Power Assist Glove. This is the first time a company is providing an inflatable soft exoskeleton as a commercial product. This soft exoskeleton device can be rented for 170,000 Japanese Yen ($137) per month. The Power Assist Glove is available for rent from Daiya Industry only in Japan until March 2017. Presumably after March 2017, the rental program will either be discontinued or the device replaced with a newer product. 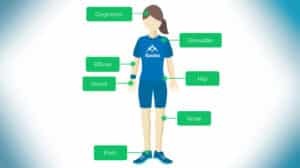 Daiya Industry Co. Ltd., Japan specializes in elastic body support clothing and braces. The Power Assist Glove weighs about 65g and is made of soft materials, making it light and comfortable to wear compared to classical rigid frame exoskeleton devices. The glove is made out of three components, a power pack with a gas canister and a controller, a glove with inflatable membrane and the connection cables. This wearable has 2 connectors, one for a sensor at the side of the glove leading to the controller and one for the compressed air. The controller and compressed gas canister weigh about 750g and fit in a 10 by 20cm space, but do not have to be attached to the user. 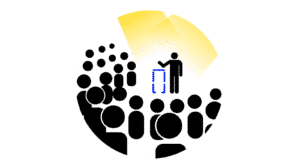 The heavy modules can be placed on a table near the user or attached to a chair or wheelchair. The glove control is very simple and intuitive. 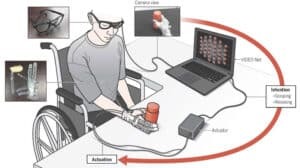 To grasp an object resting on a flat surface such as a table, the side of the hand opposite the thumb hits against the table and the power glove inflates providing assistance in grasping. When the user is done with the object they can leave it back on the table and when the side of the hand touches the table the glove will deflate, open the fingers. The Daiya Industry Power Assist Glove has the pinky ring and middle finger merged together. This saves on material and inflatable channels as the 3 fingers are treated as one unit. Other than that, the glove uses the same design and inflatable silicon membrane as other similar projects. 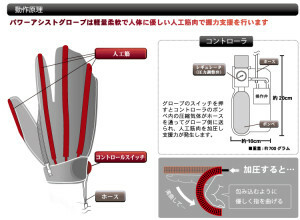 The Daiya Industry power glove is based on the research work of Professor Noritsugu Toshiro, Okayama University, Japan. He has a B.E. and an M.E. 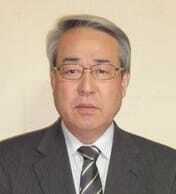 degree from Okayama University in Japan (1972 and 1974) and a Ph.D. in Engineering from Kyoto University, Japan (1982). Since 2005, he has been a Professor at the Graduate School of Natural Science and Technology. Amongst other achievements, Dr. Toshiro chaired the 24th Annual Conference of the Robotics Society of Japan in 2006 and has been working on pneumatic servos, pneumatic rubber artificial muscles and wearable power assist robots since then. Power Assist Wear Driven with Pneumatic Rubber Artificial Muscles, 15th International conference on Mechatronics and Machine Vision in Practice, (M2VIP08) ,2-4 Dec 2008, Auckland, New-Zealand (Full paper at harvard.edu) Note: the full paper also features a prototype inflatable elbow exoskeleton, not too dissimilar in concept from the one by Otherlab Orthotics. 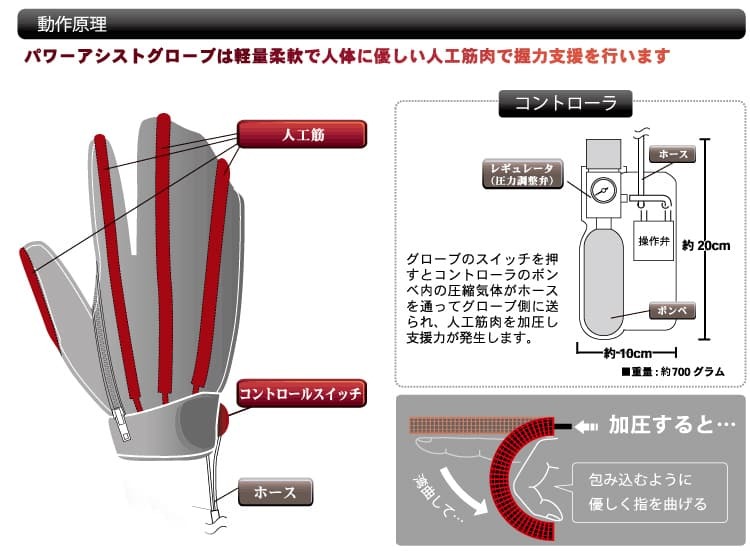 You can find more about the Daiya Industry Pneumatic Power Assist Glove on the Japanese version of their website. Is the Power Assist Glove available for purchase in the U.S? Or for testing by an appropriate candidate? Hello, to my knowledge the answer to both questions is no. Regardless, please try to contact the manufacturer directly to confirm with them.